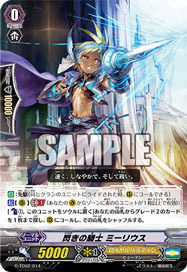 [A]: When this is placed to (V) or (R), if you have a ::Narukami:: Vanguard, choose 1 of your Opponent's Rearguards. That unit cannot Intercept for the turn. Desert filled with silver storms...... a graveyard too much for you.